Triple slot 2 fan cooler OPAF! That's like twice as big heatsink as on the EVGA one fan card, ha ha. Impressive. It would be very interesting to see what temps are after ~30mins of superposition at max TDP with max OC! Turns out that the GPU clock was unstable at settings higher than +145. From there it pretty much depends on the fan-curve/speed how many points you get in a benchmark. Cooler GPU means higher average/persistent boost speeds and thus higher points. For example, getting over 5000 pts in Superposition is mostly a question of fan vs. noise for me, not so much of the last few ticks of GPU clock. The fans on the Asus Dual become quite audible above 40%, especially because they tend to wobble a bit (visible and audible) and have changing acoustics even when they are supposed to run at a fixed speed. The VRM section can get noisy during certain loads, too. I do not own the paid version, so I cannot run the stress test, but only the benchmark. Room temperature was around 23°C during the following tests. At 100% fan-speed temperature maxes out at 53°C with open side-panel and 57°C with closed side-panel. Noise is awful then. At 50% fan-speed temperature maxes out at 64°C with open side-panel and 66°C with closed side-panel. Noise is quite tolerable, but still clearly audible in an otherwise quiet system. At 40% fan-speed temperature maxes out at 74°C with closed side-panel. Noise is very tolerable but still audible in an otherwise quiet system. Since CPU/VRM load is low during the benchmark all other fans of my system spin well below 500 rpm, so there is little air-flow or noise. 2040 MHz below 52°C, 2025 MHz below 57°C, 2010 MHZ below 62°C, 1995 MHz below 68-72°C (fluctuating), 1980 MHz minimum at 74°C. Results for "1080P Extreme" vary between 5025 to 4950 when fan-speed is lowered in between runs. Triple slot 2 fan cooler OPAF! It's worth mentioning that the Asus Dual does not use a full triple slot cooler, but what Asus calls 2.7x slot. This allows me to use the third slot for another PCIe card and still have some millimeters room between the Asus fan and the other card. For testing I put a Creative X-Fi Titanium into the lower x16 slot beneath the 2060. The X-FI's size is about half the length of the 2060 and thus obstructs one fan. As I mentioned earlier the other fan is poorly placed somewhat over empty space by Asus. At 100% fan-speed temperatures maxed out at 59°C with an open side-panel. Not too bad considering the partial fan obstruction. I also still had the protective foil around the fans (on the plastic blind) of the 2060, which may minimally/additionally hinder airflow through the few millimeters small slit. I don't know if running one fan quite small card overclocked at max TDP 77c is considered a high temp. Without the case side panel it runs 75c max. With no OC, side panel on, it runs 72c max. In less TDP demanding games this card with oc runs 65-73c, so it really depends. XC Ultra obviously has better cooling, that's why you pay quite more for it. Still 65c doesn't say me a lot as I don't know if it is stock or oc and on what game or benchmark you tested. Edit: What I saw from the reviews Evga 2060 XC Ultra runs 70c with no oc. So with max oc it should run 72-74c and perform slightly better that single a fan Evga card. Yeah very true I agree, those temps are not bad for a single card. I guess I was just hoping that they went triple slot to get similar cooling with a single fan. But I would need to do more testing on mine to see what the temps really are. I don't get the triple slot thing, these cards don't seem to run extra hot. Just lauch as game, watch the TDP monitoring and find spot to look at which consumes the most TDP, leave it for 30mins. When you look closely that "triple slot" heatsink is not that big. Still, don't really care about the temps, unless those are less than 5 degrees from thermal throttle temps. Fan itself uses like 1/3 of all thickness and runs 1k to 2.1k rpm with default fan curve at acceptable noise levels. But 2.3k to 3k sounds like a jet! 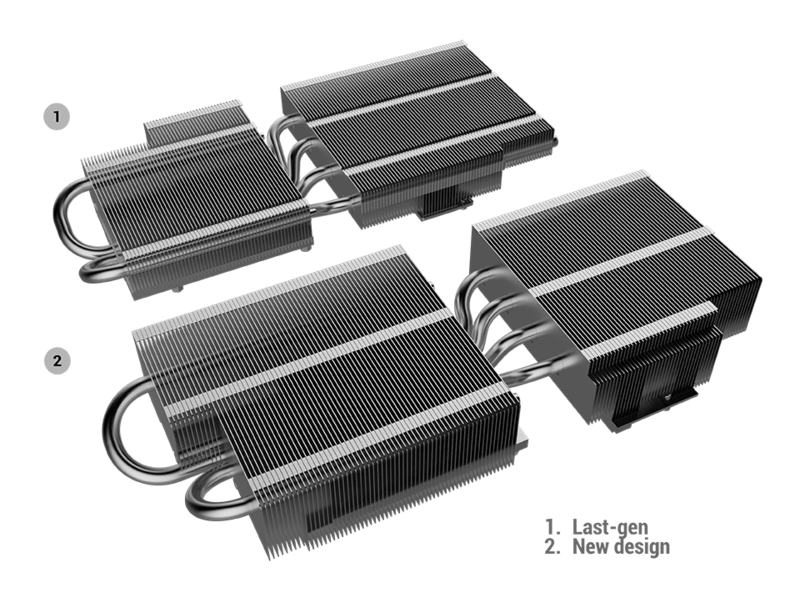 This image explains why the second fan is placed off relative to the heatsink. The old heatsink was more centered and Asus likely just kept the whole fan shroud construction the same while changing the heatsink proportions/positions. And with no air being pushed into the higher fins at the right side (of the image) the larger construction doesn't help as much as it should. The auto-fan curve keeps the fans mostly below 1500 rpm, 100% corresponds to around 3300 rpm. Last edited by Timur Born; 03-21-2019 at 12:46 AM.